I found this interesting blog and to top it off-it’s my spiritual father’s. Go http://www.tdjenterprises.com/blog/?cat=8 check out his post titled “a perfect day”… he speaks of his daughter’s wedding… it was absolutely beautiful. Apparently he picked out the dress for her-it’s gorgeous! 2 Responses to "Dream wedding"
I pray things get better between you and your dad. I’m booking my space: I’ll be bridesmaid number 2 – but only if I get the final say on the dress! Wow! 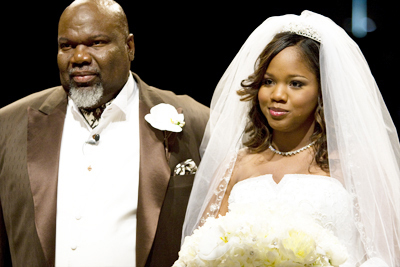 TD Jakes’ family is big and beautiful! !